Summary AC1200 Wi-Fi extender kit with "mesh" capability. 2016 is indeed the year of Wi-Fi mesh. Based on consumer Wi-Fi mesh pioneer eero's success, Wi-Fi marketeers are wasting no time slapping "mesh" onto any product that uses Wi-Fi to connect multiple access points / routers back to your wired network to form a multi-node distributed Wi-Fi network. Edimax is the latest company to try its hand at mesh Wi-Fi with its Gemini RE11 AC1200 Dual-Band Home Wi-Fi Roaming Kit. 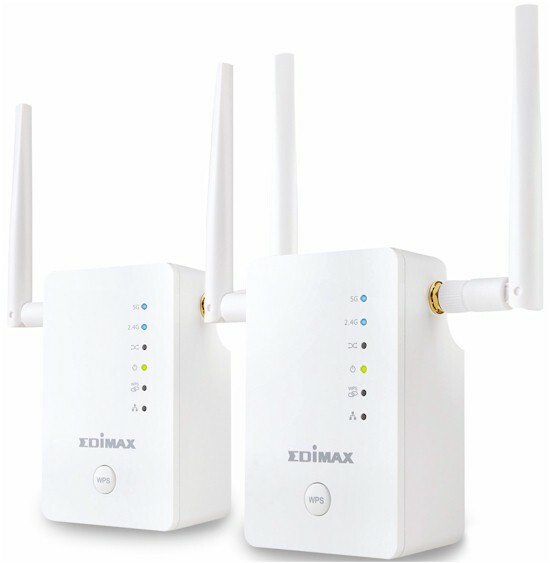 The RE11 is a kit of two RE11S AC1200 class range extenders that Edimax says "build an intelligent Wi-Fi roaming mesh network with a single SSID". The RE11 is different from eero, Luma, et al. because it does not function as a router. Instead, each RE11S can be configured as access point, repeater/extender or wireless bridge. So the kit is focused solely on extending your current Wi-Fi using more flexibility than other extenders. It also does not rely on any cloud services to power any of its features. The RE11S comes in a compact wall-plugged format. The plug is offset so you'll still be able to use the other outlet in a standard U.S. duplex. The lights, connectors and switches are called out in the diagram below. Note, however, there is no "Cross Band" LED. Version 1.04 firmware has changed this to indicate whether the RE11S is operating as a master or slave. Note also the WPS button also functions as a factory reset button if you press it for 10 seconds or until the Power light blinks. Although the intention is nice, I doubt many people will use the "Green Mode" provided by the transmit power adjustment switch. WPS is enabled by default and is used to connect RE11Ses to each other and to your router without having to use the web-based GUI. As you might expect from the rather low price, the RE11S is based on Mediatek silicon, specifically the MT7620A SoC serving as the main CPU and 2.4 GHz radio and MT7612EN for the 5 GHz radio. The photo below shows the exact view when you remove the top; no heatsinks or RF cans were removed. Here's a closer view of the component side of the board. The component summary below shows RE11S key components along with Luma's and eero's. Note the RE11S' absense of transmit amplifiers and relatively small RAM and flash. Again, remember the RE11S does not function as a router, so doesn't need as much memory. Setup is actually simpler than the extensive instructions in the Quick Setup Guide and User Manual would have you believe. Starting with factory default, if an RE11S' Ethernet port is plugged into your router / network, it will automatically set itself to access point mode. You then link the second RE11S to it by using a WPS pushbutton session. If you want to use both RE11Ses as extenders, you just start a WPS pushbutton session on your router, then press the WPS switch on the first RE11S. After that session completes, you link the second RE11S by starting a WPS session on the first RE11S, then pressing the WPS button on the second. When I did this with a router that had separate SSIDs for each band, the RE11S adopted the 5 GHz SSID for both its radios, which can be confusing to users. So if you don't want to wrassle with the RE11S' admin GUI shown below, I recommend setting a single SSID for both radios on your router before you connect the RE11S. If you use the web GUI for setup, you need to connect directly to the RE11S you are setting up using the edimaxEXT.setup 1c SSID and pointing your browser to http://edimaxext.setup. (The last two characters of your RE11S' SSID may be different.) The reason is that all mode changes require resetting the RE11S to factory default, which resets its IP address to 192.168.9.2. So while the automatic AP configuration is nice, you can't make any mode changes from there. Entering http://edimaxext.setup from an Ethernet-connected machine sent me to my ISP's search page, not the RE11S web GUI. The other thing that threw me is that only the 5 GHz LED is lit when an RE11S is in extender mode. This led me to believe the WPS session I used to link a second RE11S to the one in AP mode failed. As I found out later, this light was trying to tell me the 5 GHz radio was used for backhaul. If you log into the admin GUI, you'll find the basic settings shown below. Advanced settings are where you can change channel width and adjust transmit power. Since WPS is so central to the RE11's setup, it's enabled by default. You can disable it if you like, but I wouldn't; you'll unnecessarily complicate setup. The system maintains an RSSI value of each client device in a roaming table, dynamically learning an RSSI value of each client device to define a "Critical value" for connection. When a client device falls below this critical value, the associated RE11S disassociates the connection. Then client device should then connect to another AP with stronger signal..
All RE11Ses actively monitor all connected client devices and dynamically adjust related parameters in real time. We normally test wireless extenders using this process. But since Edimax positions the RE11 as a Wi-Fi mesh product, I chose to test it like other mesh systems. I configured one RE11S as an access point and put it into the Octobox chamber for throughput vs. attenuation testing. I upgraded to version 1.04 for all testing. An RE11S was positioned on the test chamber turntable as shown in the photo below. The 0° position had the antennas facing the chamber antennas. The white thing the RE11S is sitting on is an AC extension cord. I tested using the V9 test process with the 2.4 GHz radio set to 20 MHz bandwidth mode and channel 6 and the 5 GHz radio in 80 MHz bandwidth mode and channel 40. Because the RE11 has no routing features, you'll find it in the Wireless Charts. Unfortunately, the other Wi-Fi mesh products are found in the Router Charts, so I had to create comparison charts in Excel. I compared the RE11S to eero and Luma. The 2.4 GHz downlink profile shows the RE11S with a curve more like we're accustomed to seeing on wireless routers. Both eero and Luma pale in comparison. The 2.4 GHz uplink plot shows the RE11S again soundly beating the other two products. 5 GHz downlink shows a somewhat tighter race, but with the RE11S again with superior performance. Only on 5 GHz uplink does any other product outdo the RE11S. eero has surprisingly high throughput in this test, but not as good range as the RE11S. The second part of wireless testing used the open air mesh test process I've been using with all mesh products. I set one RE11S up as an access point and the other as extender. As I found with previous testing, the NETGEAR A6200 client appears to prefer to connect to the 5 GHz band and that's what it did with the RE11. The RE11S' downlink performance was more like both Amplifi's and Luma than eero. Note I haven't retested eero yet with its new "True Mesh" firmware. You'll see those results in the upcoming Google Wifi review. Note the Kitchen - Reconnect test does not represent a two-hop test for tht RE11S or Orbi, as it does for the other products. I forced multiple reconnects for this test to see if the client would change bands; it didn't. In each case, the NETGEAR A6200 adapter reconnected right back to 5 GHz. I don't know why Edimax throughput increased 10 Mbps on the reconnect test. Hallway location uplink shows lower throughput for the RE11S, moving it below everything except Luma in most locations. Previous tests show moving the hallway node to the living room improved performance and it did again for the Edimax, with downlink throughput more than doubling for most tests. However, the living room location also improved performance of the competition. eero once again stayed ahead of everything other than NETGEAR's Orbi, which blows all competitors away due to its dedicated 4x4 AC 5 GHz backhaul. The RE11 hangs out in the lower half with Luma and Amplifi. Uplink results are similar to downlink, with the Edimax sitting between Luma and Amplifi for all tests. The question I'm sure you're asking is whether the RE11S really forms a mesh wireless connection. After all, it's only 130 bucks ($65 / node). If you define mesh as the ability of two wireless nodes to connect to each other without having to go through the root (Ethernet-connected) node, then, yes, the RE11S does form a mesh network. But my limited exploration found the RE11S' "mesh" is pretty rudimentary. I tested by setting up the ASUS RT-AC66U used in the Wireless Extender test process in my office and reset both RE11Ses to factory default. I then linked the first RE11S to the ASUS using WPS and placed that node in the Living Room location. I then shut off that node, went to the Kitchen location and ran inSSIDer on my Moto X Gen 2 phone to check for signal from the ASUS router. There was no 5 GHz signal and only a very weak 2.4 GHz. To make sure the RE11S couldn't link back to the ASUS, I moved the linked Living Room node to the Kitchen. It did not connect. I then moved the Living Room node back to the Living Room and waited for it to link to the ASUS. I then plugged in the second node, waited for it to boot, then started a WPS session on the Living Room node. Pressing the WPS button on the Kitchen node resulted in a successful link. I repeated my tests with this two-hop configuration with the results shown below. I should note that for this series of tests, the test laptop with the same NETGEAR A6200 USB adapter connected to the 2.4 GHz band each time it roamed. I didn't need to force a reconnect in the Kitchen location, either. So the Kitchen and Kitchen - Reconnect tests both represent two-hop performance, with the test client connected to the Kitchen RE11S. What's interesting here is that throughput didn't change much from the single-hop case, which produced 61 / 75 Mbps downlink and 62 / 60 Mbps uplink connected to 5 GHz. While poking around, I found the IP address of the extender and logged in. The status display shown below revealed what looked like only the 5 GHz radio operating in extender mode, i.e. performing backhaul. Edimax confirmed only one band is used for backhaul, with 5 GHz the default using WPS to link extenders. If you want 2.4 GHz to be used for backhaul, you'll need to use the setup wizard. In either case, backhaul connection does not change. I performed two quick walk-around tests using a Moto X Gen 2 phone to see how smoothing roaming was. For the first, I started a Pandora stream and walked around the house listening for drops (there were none) and using Zoltan Pallagi's WiFi Network Analyzer Android app to monitor the connected BSSID (MAC address of the connected AP). The phone did indeed switch among RE11Ses pretty quickly. For the second test, I watched a Netflix video, which streamed without a hitch as I walked all over the house. Note my test included changing floors to move out of the RE11Ses range and to the ASUS router's. I have to admit I was skeptical of Edimax' claims for both "mesh" operation and smooth roaming. But both features actually do seem to work. Yes, setup can be confusing and you may lose some hair trying to use the setup wizard to set things up vs. using the WPS method. But once it's up and running, you may be surprised at what this $130 kit of smarter-than-average AC1200 class extenders can do. eero / Luma / Orbi it ain't. But if you need to daisy-chain wireless extenders to reach a dead spot, Edimax' RE11 kit could be a (much) cheaper way to give it a go.